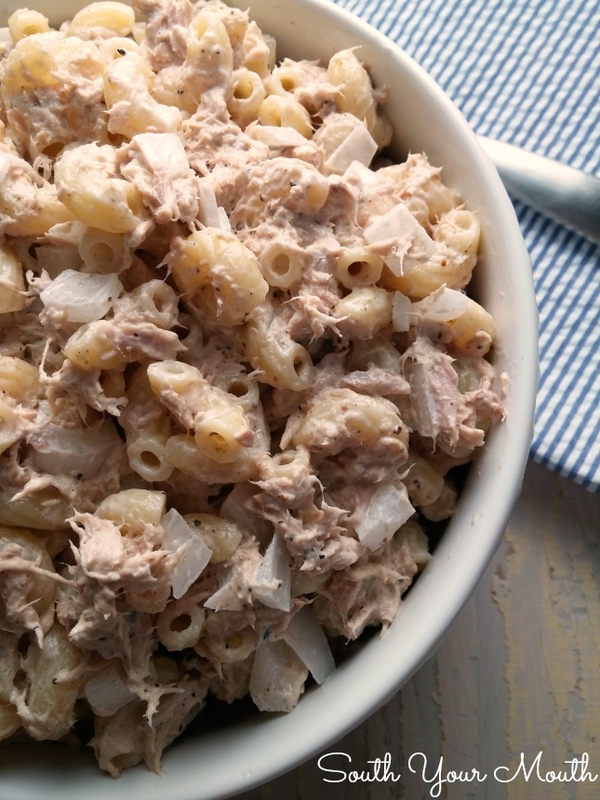 A basic, hearty recipe with canned tuna and macaroni noodles that can also be made with chicken! As I’ve mentioned before, I’m old enough that when I was in college, people actually ate in the school cafeteria. We didn’t have credit cards for luxuries like Pizza Hut and McDonalds. Or cable. And Starbucks was just something from The Real World: Seattle. Actually, now that I think about it, college back then was a lot like going to a sleep-away camp. You moved in with strangers and shared a bathroom with them. You were provided a desk, a dresser and a bed (not a kitchen, a living room or a laundry room). And you all ate crappy food together in the cafeteria. Anyway, whenever you or your roommate(s) went home for the weekend or a holiday you always brought back food from home and tried to make it stretch as long as you could. One of my favorite things that Shelly (my roomy and BFF) would bring back from home was a GIGANTIC tupperware container of tuna noodle salad. I know. I know it doesn’t sound like anything spectacular but y’all, to this day, it’s one of my favorite things to keep around for a hearty snack or quick meal. Sometimes I make it with chicken. Sometimes I add chopped boiled eggs. Sometimes I add diced celery or relish. You can make it anyway you prefer! This is just a good base recipe to help you get started! For some reason, Shelly and I often ate this on saltine crackers (hey, we didn't know carbs were evil yet in the early nineties!) and, to this day, I still love to eat it that way! Cook pasta in liberally salted water per manufacturer’s instructions for al dente preparation. Drain then rinse in cold water. Drain again very thoroughly. Combine noodles, tuna, mayo, onion and seasonings to taste and stir well. Refrigerate to store in an airtight container up to one week. *If you don’t have Old Bay, that’s OK. I use it because I think Old Bay just goes with anything at all to do with fish or shellfish but also because it has a hefty amount of celery seed in it which I think is perfect in any sort of mayonnaise based salad. My grand-mother made this all the time in the summer, but with peas added (I use frozen ones - cook & then cool - because they are crisper than canned. It's a great addition to an already great salad!!! I grew eating this salad, but we used seashell shaped pasta (seafood related;-)), chopped celery, onions and sweet pickle. Now I add capers instead of the sweet pickle. Yum! I grew up enjoying this salad at all of my family's cookouts. We always add in some finely diced celery, a chopped hard-boiled egg (or two), and recently.... I started to add in some frozen peas. (We're not fans of adding mustard, but many folks like to do so.) "Macaroni Tuna Salad" ROCKS! BTW, next time I'll try it with chicken....sounds delish. 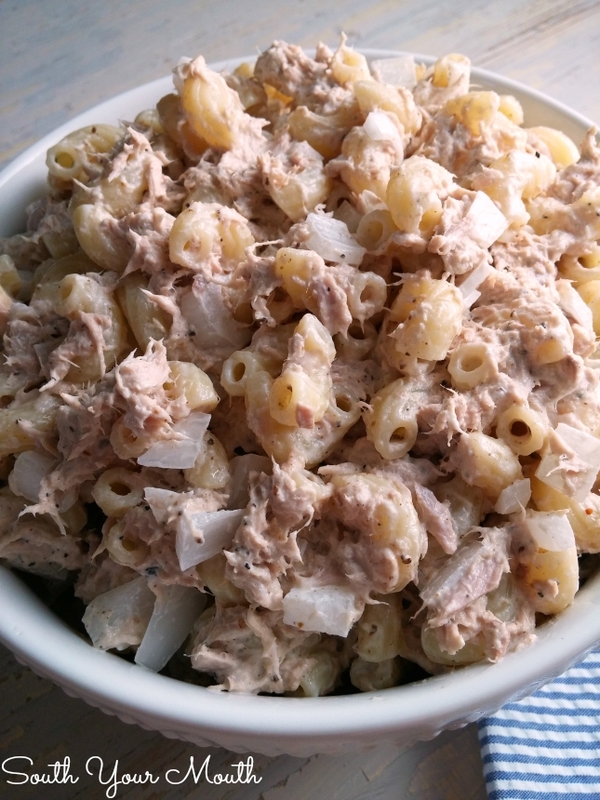 Mandy, you must have been reading my mind when you decided to post this tuna & pasta salad! 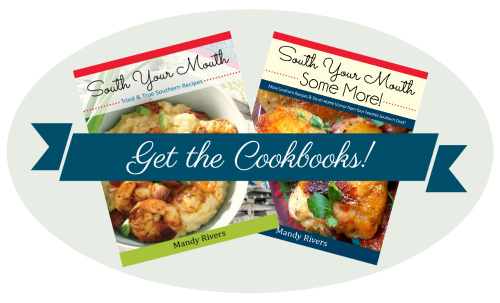 It is sooooo dang hot and humid here in south-central Mississippi, I had decided to make an entirely cold supper tomorrow evening so my husband can come home to a cooler than usual house after working outdoors all day in this miserable weather. Planning to make this recipe along with a cucumber-tomato salad, keeping it cool, cool, cool, so thank you! Oh. My. Goodness. This just makes my heart happy. I don't have a "my mama made something like this" story, I just had a "dang that looks good" moment when I saw the picture. Used some tuna with peppers to add some heat and some hard boiled eggs just because it sounded good and I'm pretty sure I've found my lunch for the next coupla days. we all must have cousins together! childhood favorite. now as suggested, I also use chicken, keeping a can of it for when there's nothing to fix... also add dill pickles and hardboiled eggs or chickpeas... the list goes on. i'm this recipes will be around forever. I make mine with small rings and cut the onion and celery about the SAME size as the rings. Most women won't take the time to do that. I'm a man(retired, with a lot of time on my hands). My Mom used shell shaped pasta and grated the onion. Tuna and Noodles is what it she called it. Mayo, S &P, and you are good to go. Love it! I've made something similar for nearly 35 years. I add some crisp, crumbled bacon, a jar of pimentos, use about half sour cream or Greek yogurt and half mayo, and some chopped tomatoes. Love, love, love it! In fact, love it so much, I can only make it once or twice a year because I will eat waaaaay too much if left alone or have leftovers. Mine is very similar, I add the chopped egg, celery, sweet red pepper and chopped green pimento stuffed olives. You can even find the already chopped olives in a jar sometimes. It's a favorite of mine! I have been making Tuna Mac Salad forever! Mine has lots of fresh veggies (bell peppers, tomatoes, celery, cucumber) and my dressing is mayo, lemon juice, celery seed and salt & pepper. I make a gigantic bowl a few times every summer and the family just devours every last bite! This was my go-to salad for potluck at work. There were never any leftovers and always requests for more! This brings back many fond memories. I think I'll make some today. As a kid growing up my mum would make tuna casserole. Same concept as your recipe, but we make it with condensed mushroom soup (ie. Campbell's)and frozen peas. Super quick to make and is perfect comfort food! ok...I make it with peas (I use frozen and put them in with the mac while boiling, then add everything else. I sometimes make deviled eggs to put on top.. also I sometimes use cheddar cheese chopped up to mix with it.. Yum!! I always use the small or medium seashells and hard boiled eggs, celery onions diced gr. pepper and to the mayo I add some sour cream and ranch dressing, plus pepper and very little salt and lots of tuna. seldom use peas as the family can go without them added. Does this call for cooked or raw onions? I will try it this weekend. I grew up eating this. I add Dill Pickle Cubes or the Dill Relish to mine and put it on Ritz crackers or on top of a salad with some Sweet Tea. The best anytime meal. I like to add chopped cucumber with cucumber ranch! One question, when you say mayo are you referring to actual mayo or more of like miracle whip? I have made a similar recipe forever but i always used ham, frozen peas, cheddar cheese, onion, celery, and various other veggies, with med shells and miracle whip. So i just wanted to check since they can definitely alter the taste completely since they arw so different. Thank you! !